It's the middle of the summer and it's friggin oyster-down-your-gullet season, right? 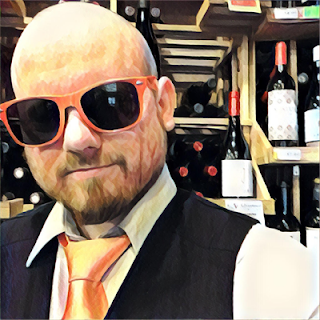 So I'm gonna review a bottle of the ultimate oyster wine: Muscadet Sevre et Maine. Just don't get this wine mixed up with Moscato like many people do. This is not sweet and it's not mentioned in rap songs. 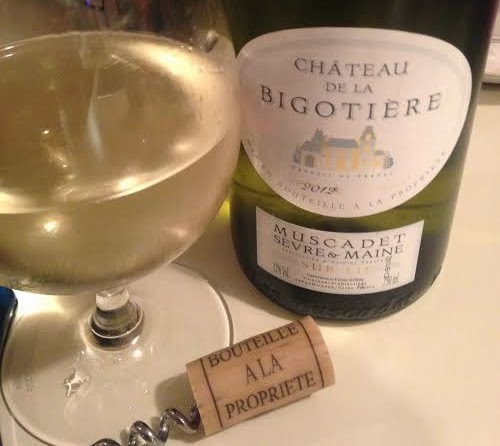 Muscadet is located in Loire Valley, France and is made from the Melon de Bourgogne grape. It's pretty rare that you find one in the USA that's isn't sur lie, which means "on the lees", which means it was aged with the dead yeasts that fermented it. This releases bready flavors through autolysis and adds complexity. If that freaks you out: don't be concerned. You've had this before in Champagne. Chateau de la Bigotiere is in its third generation now and is run by two brothers, Christophe and Cedric Gobin. Their 2012 Muscadet won a Bronze Metal in the 2013 Concours General Agricole de Paris. Sooooo.... alright! That's enough precursor! I need to drink some wine. It's been a long day. The package manages to be both classy and modern. You can bust this $12 bottle out and impress others pretty easily. Sur Lie is actually embossed on the glass, which is kind of weird. I'm not a fan that they use a synthetic cork; they should just go screwtop. The color of the wine is very light, almost on the verge of being mistaken for water. The nose is Floral and Mineral City. The floral aroma is along the lines of the yellow, wild kind like buttercups and daisies. I don't get cobblestone on wine very often but this wine reminded me of laying cobblestone in the endless summer of 2001, when I was 21 and landscaping 14 hours a day. There's just a tad bit of brine, just enough to be there but not be a focus. The first thing I get on the palate is saline, then it's spiked by the last remnants of a lemon slice (you know, when it gets down to the last bits of pulp and the flavor of the exocarp joins in), then it levels off into melon until you swallow. I swear the finish is lime with lightly toasted Canadian white bread. I'm not kidding. Prove me wrong. At one point I burped and that tasted like a fino Sherry. Again, not kidding. My experience with Muscadet is limited and I've found most of the ones I've had are either too neutral or too bready. Of course, I've had some awesome ones too. But I have to say this is the best I've ever had. When I take that into consideration and the fact that it's only $12 it's a no-brainer. I'd buy the hell out of this all summer if I didn't have so many other wines I want to review. I've been steering customers away from my top selling Muscadet, which is $9, and turning them on to this one and it's been going very well. They've been coming back for more and not even looking at their old preference. People are willing to pay that extra $3 when it's totally worth it, and this totally is.